Fashion chain Primark has launched an investigation into allegations one of its suppliers has breached employment and immigration laws. The Observer newspaper reports an investigation found Manchester-based firm TNS Knitwear was paying illegal workers less than the minimum wage. Some workers were caught being paid £3 an hour, by an undercover journalist. Primark said it was "extremely concerned" by the allegations, which have been denied by TNS Knitwear. The newspaper says the workers were being paid the sum, just over half the minimum wage of £5, for 12-hour days, seven days a week. The investigation focussed on TNS Knitwear, which says it supplies up to 20,000 garments to Primark a week. The Observer reports Pakistani, Afghan and Indian employees at TNS Knitwear admitted their illegal status in the UK on camera. A Primark spokesman said: "Primark is conducting its own investigation. Once that investigation is completed, it will decide how to proceed. "Meanwhile, Primark has handed all relevant information passed to the company over to the relevant enforcement agencies so they may take action." 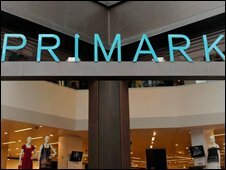 On Saturday, Primark agreed to remove references to the Ethical Trade Initiative, the trade body which monitors Britain's top retailers, from its 140 shop fronts. A full investigation into how some knitwear destined for Primark is made will be on BBC News at Ten on Monday.